Choose a discussion topic that will inspire continuous conversation. Make sure your discussion topic isn’t already covered in an existing discussion. If some group members are already having a discussion about the topic that you are interested in, then go ahead and join the existing conversation! Any discussions found to be duplicates may be reported by the Group Administrator, and removed by the GrabCAD Support Team. Make sure your discussion matches the group theme and follows group guidelines. The reason for joining a group is to discuss topics related to that group’s subject of focus, so please try and stay on topic! Also, please make sure that your discussion respects the Group Guidelines laid out by the Group Administrator. Any discussions found to have nothing to do with the group focus, or found to be in violation of the Group Guidelines, may be reported by the Group Administrator and removed by the GrabCAD Support Team. 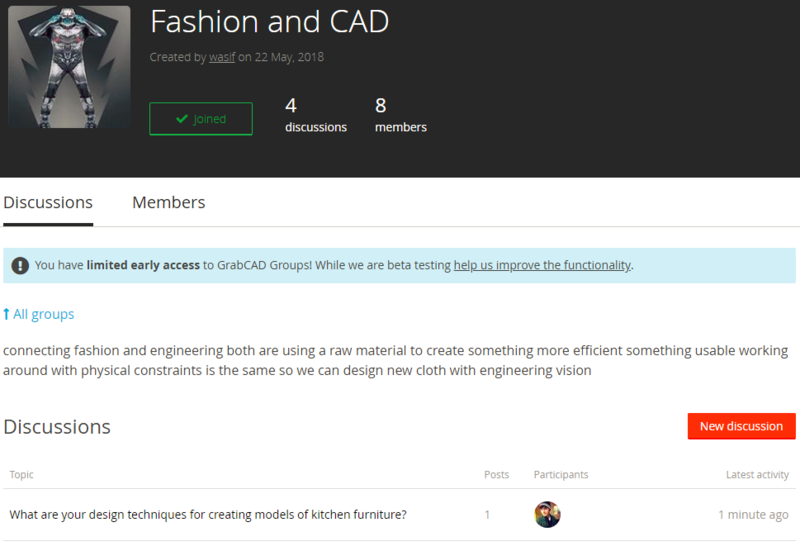 Below, you'll see a group about "Fashion and CAD", yet there's a discussion about kitchen furniture. While it is a great discussion topic, it does not belong in a group about fashion.